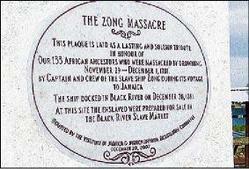 ... 1781, a 3-day massacre began when crewmembers tossed 54 African persons held in slavery out of the ship Zong and into the Atlantic Ocean. More than 120 persons would perish in this manner -- undertaken by the ship's captain, who aimed to file an insurance claim for the at-sea loss. "Another ten, in a display of defiance at the inhumanity of the slavers, threw themselves overboard and, in the words of a contemporary account, 'leaping into the sea, felt a momentary triumph in the embrace of death.'" (credit for photo of commemorative plaque, unveiled in 2007 in Jamaica) The insurance claim would be denied, but no one would be prosecuted in the incident; however, it provoked antislavery abolitionists to greater action.